Bright and early on my second day in the Napa Valley I drove up into the Spring Mountains, hoping that the weather would improve, as my first day had been rainy and gloomy. 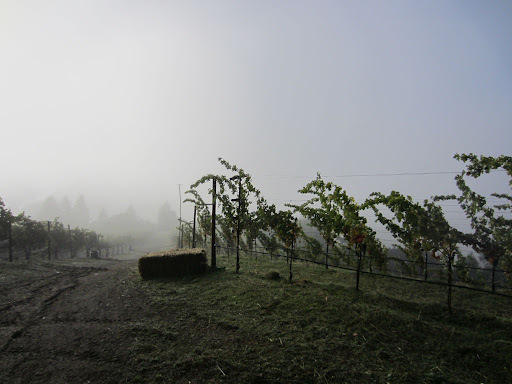 I had corresponded with JJ McCarthy from Cain Vineyard and Winery before I left, and arranged to visit at 8:30am, so I got a really great view from a lot higher up. The Cain vineyard is at least 650m above sea level, whereas the Napa Valley floor is only about 200m, so elevation is clearly on their side. The soils on Spring Mountain are also a lot tougher, so the vines have to work harder to find water and nutrients to thrive. One of the first things I noticed were fewer and smaller bunches of fruit than in the valley floor. Tasting the fruit was thrilling, as it is the first time I can remember actually tasting terroir in grapes, and the cabernet sauvignon tasted like wine! Cain produce only three wines. 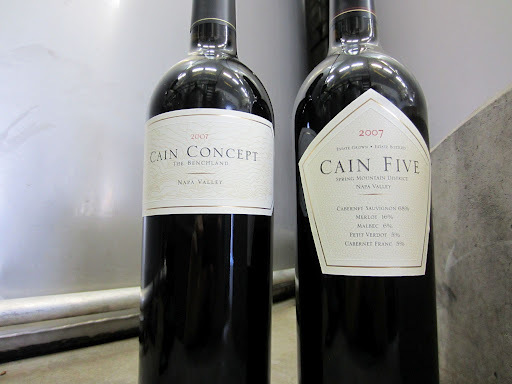 The Cain Five is named as such because it uses a blend of the five classic Bordeaux varieties; cabernet sauvignon, merlot, cabernet franc, petit verdot and malbec. The Cain Concept – The Benchland is the little sister to the Cain Five, vinified the same way but tends to have more cabernet sauvignon. The Cain Cuvée is a very experimental wine, a blend of two vintages to create a soft approachable blend consisting of almost 50% merlot, and also blends valley floor with Spring Mountain fruit. The wines were exceptional reflections of their origins and were definitely not in the full-bodied, heavily extracted, high-alcohol and overly oaked wines one would expect from the Napa. The Cain Five in particular showed nuances of earth and savoury spiced meat characters, and was very subtle and elegant. At $100 a bottle is was probably one of the best value I tasted in the region. I had been recommended several wineries in California by some winemakers back in Australia before I left. One of these wineries was Miner Family Vineyards, located in the Oakville sub-region on the Silverado Trail. 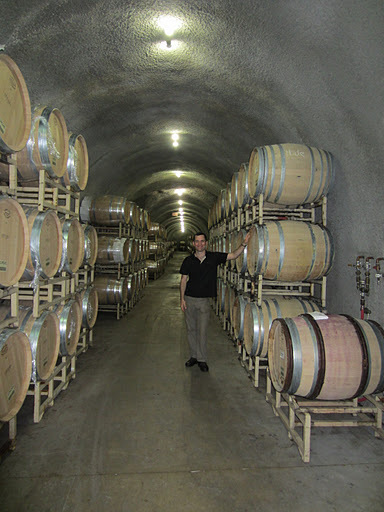 Miner produces a great range of wines, and they source fruit from several regions in California for their wines. Their Bordeaux variety based wines understandably come from their own and other Napa Valley vineyards, they source viognier from Madera (not Madeira), their sangiovese comes from Mendocino, and their pinot noir comes from the Santa Lucia Highlands. Dave Miner clearly has identified these regions as producing exceptional fruit for these specific varieties. The wines are very good, full and fruit driven examples, but not heavy or alcoholic. They have a really great Champagne-inspired cellar where they store their barrels, and their direct marketing wine club program is probably one of the best I have seen. From here I headed down to Clos Du Val, one of the wineries also included in the 1976 Paris Tasting for their 1972 Cabernet Sauvignon. I was fortunate to have tried their entry-level wines back in Melbourne and was very impressed that even at that level they were expressing their origins. The original winemaker when established in 1970 was Bernard Portet, brother of Dominique Portet, who both grew up in Bordeaux where their father was a technical director of Chateau Lafite-Rothschild. The brothers clearly have Bordeaux in their blood, Dominique settling in the Yarra Valley and Bernard and in the Napa Valley. 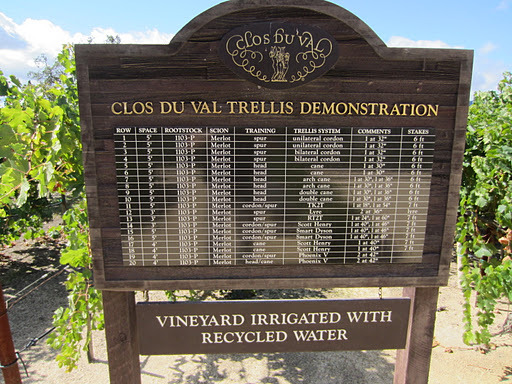 The focus at Clos Du Val is naturally on the Bordeaux varieties, and they are the only winery I visited who utilised semillon in a SSB blend. The Stags Leap Cabernet Sauvignons were outstanding, and the Reserve Cabernet Sauvignons even better. The winery is a lovely chateau inspired building, and the vineyards utilise numerous viticultural techniques. 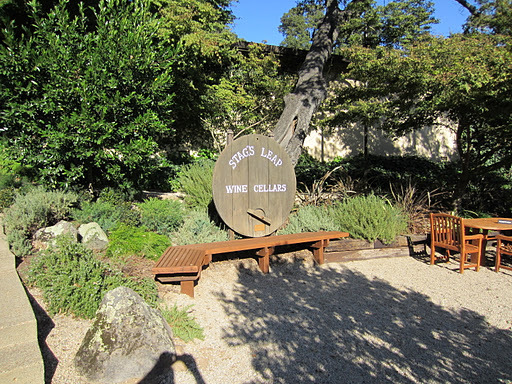 Stags’ Leap Winery, part of the Treasury Estates group, is located on a truly historic site. It dates back to the mid-1800s and had a varied and interesting background. 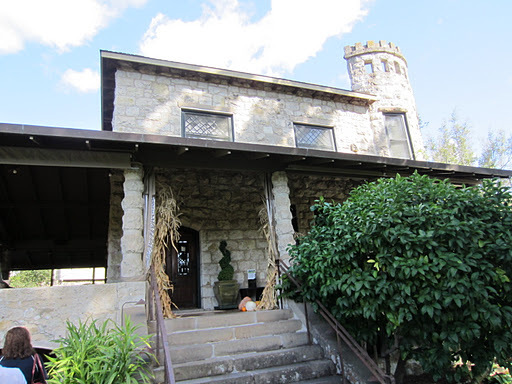 It was actually one of the original owners that named the estate the region is named after, from a Native American legend of a stag that would escape hunters by leaping off a precipice into mist-covered valley. At one point it was run as country accommodation and during prohibition a “Speak Easy” was secretly run in the cellar. One of the first in-ground swimming pools was built here, and during WWII the pool was used by servicemen for its healing properties whilst on furlough. The cellar under the hill was excavated by Chinese migrants who worked on railroads as they were experts in explosives. The wines today are very good fruit-driven wines, and utilise Rhone-varieties to make rose and red blends. It is a great tour, particularly for its historic significance. Often confused with the previous winery I visited, Stag’s Leap Wine Cellars who were established around the same time as Stags’ Leap winery were re-established, is just down the Silverado Trail. It was this winery who won the 1976 Paris Judgement with their 1973 SLV Cabernet Sauvignon, only their third vintage! Now owned by Chateau Ste Michelle and the Antinori family, Stag’s Leap produce exceptional wines from exceptional vineyard sites. Consequently several of their wines are exceptionally priced, but still reasonably considering some of their neighbours. Many of the wineries included in the Paris Tasting are celebrating the 35th anniversary, and Stag’s Leap are no exception. The SLV Cabernet Sauvignon is an extremely contemplative wine, very brooding and dark with balance and length, and I heartily endorse it if you can find any. Click here to see more photos from Day Two in the Napa Valley. A Guide to Choosing the Right Wine Glass! A podcast about wine, wine culture and wine people. Every week a different guest from the wine industry joins host The Intrepid Wino (aka James Scarcebrook) for a casual chat about the world of wine. All content on this podcast remains the sole property of the author unless otherwise acknowledged and appropriately credited. Unauthorised use and/or duplication of content without express and written permission from the author is strictly prohibited. Content may be used for reproduction provided that full and clear credit is given to James Scarcebrook and/or The Intrepid Wino with appropriate and specific direction to the original content. All content on this website, including text, images, audio and video, remains the sole property of the author unless otherwise acknowledged and appropriately credited. Unauthorised use and/or duplication of content without express and written permission from the author is strictly prohibited. Content may be used for reproduction provided that full and clear credit is given to James Scarcebrook and/or The Intrepid Wino with appropriate and specific direction to the original content.